London - Arsene Wenger claimed Arsenal's battling 0-0 draw at Chelsea proved his players have the courage and commitment required to match the champions. Wenger's side had endured a miserable run at Stamford Bridge in recent years, but they finally emerged unscathed from west London thanks to an unusually feisty display. In the past, Arsenal have been bullied into submission by Chelsea, losing five years in a row at the Bridge. While they didn't secure a rare victory at one of their top four rivals, Sunday's gritty display certainly ruffled Chelsea's feathers. Arsenal, so often derided as a soft touch, matched Chelsea blow for blow, frustrating the hosts to such an extent that Blues defender David Luiz was sent off in the 87th minute for a reckless two-footed lunge on Sead Kolasinac. It was left-back Kolasinac, a pre-season signing from Schalke, who epitomised Arsenal's defiance with a series of crunching tackles, including one with Luiz that may have sparked the Brazilian's moment of madness. Wenger insisted he never doubted Arsenal's character, but conceded it was pleasing to see them show it in such a tricky fixture. "There were battles all over the pitch. We responded well. In a time when we were questioned, I like the team showing that kind of response," Wenger said. "It was a deserved point, I felt we could have won with a bit more quality." 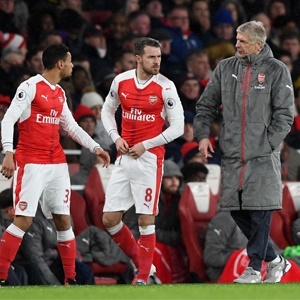 After damaging defeats at Stoke and Liverpool earlier this season, Wenger acknowledged it was essential for Arsenal to rise to the occasion against a Chelsea side desperate to avenge their FA Cup final loss to the Gunners last season. "We have to accept when we don't perform we will be criticised. The only way to answer is on the pitch," Wenger said. "It was a question today what would happen with our attitude. It was vital we came out with a solid performance. "The challenge was higher than the Cup final. They played at home where traditionally they are very strong, but we did exactly what I expected." The only frustration for Arsenal was a failure to take their chances, with French striker Alexandre Lacazette largely anonymous before being substituted. Wenger defended his club record signing from Lyon, saying: "Lacazette worked hard for the team but it takes time for him to maintain that level for 90 minutes. "It's normal that we bring in fresh legs, we had (Alexis) Sanchez on the bench." Chelsea have now had four players sent off this season and three dismissed in their last three meetings with Arsenal. But Blues boss Antonio Conte refused to condemn Luiz for a needless challenge that will leave him to serve a three-match ban. Instead, he insisted it was referee Michael Oliver's failure to stop play for a previous offence by Sanchez that sparked Luiz's dismissal. "All I can say is it's very important to see what happened before the tackle. For sure there was a foul," he said. "The referee took this decision. If he stops the play before I think it wouldn't happen. "When there is a foul continually, they continued to push him, the referee has to use the whistle." Despite Chelsea's lamentable red card record of late, Conte is adamant his team don't have a discipline problem. "I don't know. Do you think we are becoming bad?" he said. "For sure it's a strange situation. We have to try to improve with this. "But also we hope to be more lucky in the future with the referee's decisions. "Sometimes the opponent deserved a red card and instead they played with 11 men." Although Chelsea missed a chance to close the gap on the leaders, Conte isn't about to panic. "Sometimes you forget that Arsenal is one of the six top teams," he said. "They are a strong team. It's normal to find this type of situation against them."